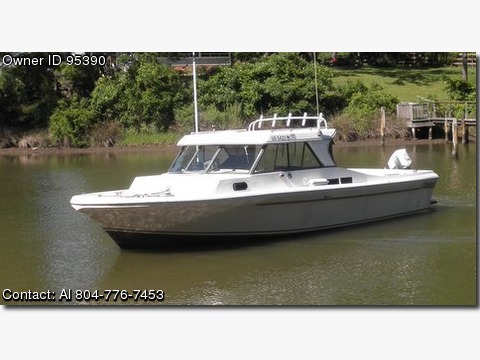 Contact the owner Al @ 804-776-7453 or awild@verizon.net.Engine 5.7, 260hp gasoline MerCruiser full inboard freshwater cooled and a 9.9 hp Honda four stroke, electric start, long shaft trolling OB motor all with the following features - Beam….10’ Approx Weight …..5510 lbs Fuel Capacity ….120 gal - 5 -Rod holder storage rack on the roof and 4- Rod holders in cockpit - Garman GPS, Color Fish finder, Garman BW Fish finder, VHF radio, Compass - Teak swim platform with retractable outboard motor lift device - Weatherproof cabin windows and Bomar forward Deck hatch - V-Birth w cushions storage underneath - Approved Head and holding tank - The cabin does not leak and has plenty of room for rods tackle - Dual 12V batteries, selector switch and dual charger - Deluxe pedestal helm passenger seats and Lockable cabin door - Drop curtain enclosing hard top are excellent for fall rock fishing - Large cockpit sitting cushion over engine cover - All bronze thru-hull seacocks - Cockpit boarding steps - 2- 12V Bilge pumps, fire extinguishers and throwable - Danforth anchor, chain and rode Comment With its roomie10 foot beam, the boat is very stable and economical to use for the day or as an overnighter. The 9.9 hp OB motor will move the boat at close to hull speed for economical trolling or returning to port in an emergency. The boat has been lift kept out of the water when not in use and is in good condition.